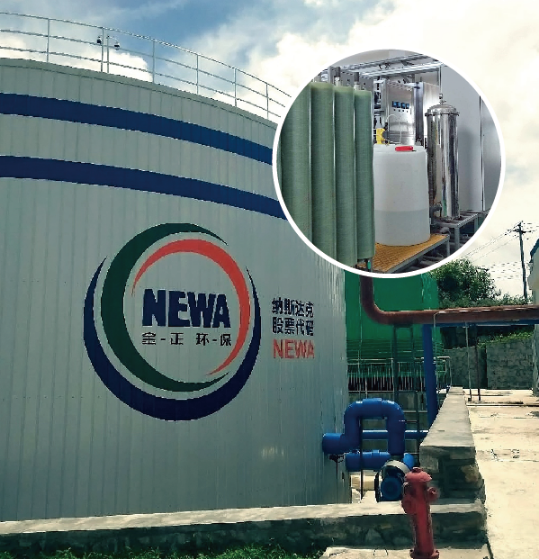 Landfill leachate expansion project using membrane technology in Shandong province - Examples - Newater Technology, Inc.
Sanitary landfill was the main solution for garbage treatment due to the immature waste sorting system in China. Landfill leachate, resulting from sanitary landfills, is very harmful to the water ecosystem. The landfill leachate contains a lot of toxic and harmful substances, and its organic pollutant concentration is also quite high. The improper disposal of landfill leachate will cause extreme pollution to our environment. The scale of membrane treatment was 500 m3/d, and the overall scale of the plant after expansion was 1200 m3/d. Inflowing water quality: CODcr = 20000 mg / L, BOD = 9000 mg / L, ammonia nitrogen = 1800 mg / L, TN = 2000 mg / L, SS = 2000 mg / L pH = 6 ~ 9. Outflowing water quality: The outflowing water should satisfy the standard listed on Table 2 of the “Domestic Waste Landfill Pollution Control Standard (GB16889-2008).” At the same time, it must meet the "Emission Standards for Domestic Waste Water Landfill Pollutants" in Shandong (DB37 / 535-2005) CODcr ≤100mg/L BOD≤20mg/L TN≤40mg/L Ammonia Nitrogen ≤15mg/L TP≤0.5mg/L SS ≤30mg/L pH=6~9. We adopted the process of "external membrane biochemical reactor MBR + DTRO". Our contract was signed for this project on May 2, 2017. The wastewater treatment equipment was delivered to the project site on October 3, 2017. After a short period of successful commissioning operation, we handed over the project. The project is running as scheduled. 1. Our system has strong stability and flexibility, as well as strong adaptability to the change of leachate water quality and environmental conditions and strong impact load resistance. 2. In the control process of the system, the PLC central control system is being utilized, which has a high level of automation control. Remote central monitoring can be realized. The automatic control function meets the needs of daily operation management and maintenance. 3. The system’s operating cost is lower under the premise of ensuring the processing efficiency of the system. 4. The system uses a small footprint of the area. 5. The overall layout of the project site is reasonable. It is a modern sewage treatment center with nice landscaping.